Lost Cat? I Don’t Think So. We owned three dogs and four cats during my childhood years. 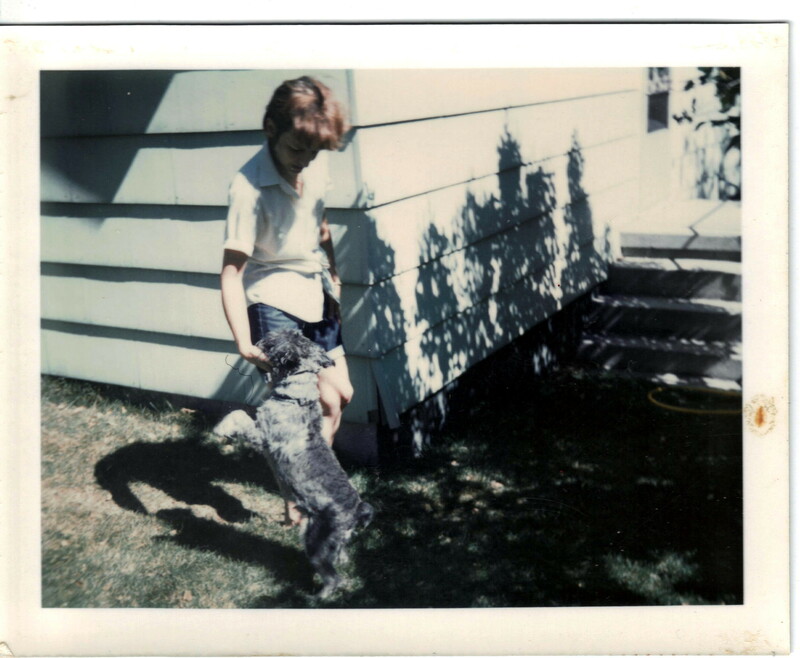 One dog died early in my childhood (Terry says it died in the backyard in Elko – that was Squeaky the Chihuahua mix). Butch was a dog who came to us and just sort of moved in. He died in February of the year I turned 10 (1966) and he gets his own post. Then we had the rescue Schnauzer, Mr. Tack, shown here with his best friend, my mother. Tacky deserves his own post, too, if only because he managed to humiliate me in 4-H. But tonight, it’s about the cats. MY cats, specifically. 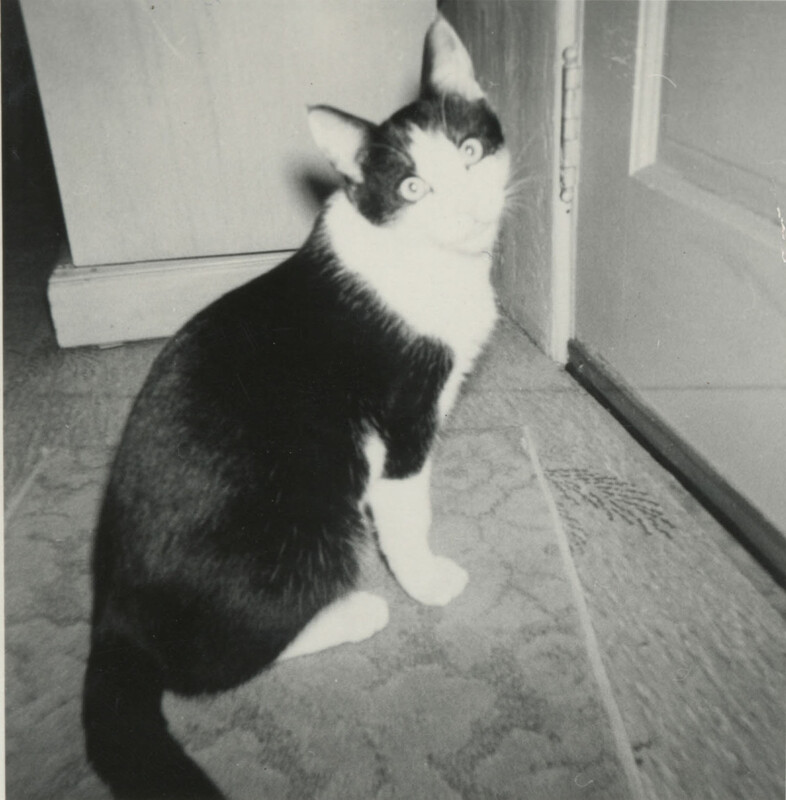 We had four, beginning with the black-and-white Tuxedo cat that followed my sister home one school day in the mid 1960s. John Jacob Jingle Heimer Schmitz Radar-ears Wilcox. He had nine names, but I only remember the first five and we called him Jacob or Jake. I know we have photos of Jake sleeping in the bathroom sink, but I don’t personally have them. He came to us as a half-grown kitten that followed Denny the two blocks from school, across one busy street. Dad – who claimed to hate cats – did not believe Denny. In fact, he went into one of his really angry modes and we decided it was best to obey without question. He made us carry the kitten back to the school and run home. The cat ran home with us. We didn’t run fast enough (Dad declared), so the next trip was with our bicycles. We had specific instructions on where to set the kitten down and how fast to ride home. Dad hit the roof and we were sent off once again, with instructions to ride “really fast” home. Dad even stood in the drive and watched. We were terrified of him and we obeyed. We rode, really, really fast and we prayed silently that the kitty wouldn’t get run over crossing Bridge Street. The cat followed us home. Dad threw up his hands and said we could keep him until someone claimed him. Mom then ran an ad for two weeks in the local newspaper but no one claimed him. It would seem that he had chosen us – or chosen Dad, in particular, because it was Dad’s lap that Jake migrated to. Jake slept in the bathroom sink, opened Christmas presents, and stomped across the tin roof so loudly that you could hear him in the house. He tolerated dogs and kids. Jacob loved the old grouch, and often curled up in Dad’s lap at night, purring loudly. The next summer, when Jake was an adult cat, the lady in the station wagon drove up and cornered Denny.. She had a carload of little kids and she confronted my little sister on the sidewalk, accusing her of “stealing” their pet cat. Denny burst into tears: Jake was her cat, and she’d stolen nothing. Jake followed her home; no one claimed him!The woman was pure evil. I tried to talk to her (I was probably 11), but the woman was a witch and her kids were just as mean. So I ran and got mom. The Big Gun. Mom looked at her crying daughter who was hugging Jake with all her heart. She looked into my big eyes. She leaned into the station wagon and asked what the problem was. She listened. She nodded. She assessed the faces of the little kids in the idling station wagon. She told the woman that we ran an ad for two weeks the prior year – why wasn’t the ad answered. Lady didn’t get the local newspaper, but that was *her* cat. Lady in the idling car said, “Fair.” I think she even smiled, because everyone knew that Lassie would choose the rightful owner, and she was self-righteously right about who the cat belonged to. Mom knew exactly what would happen before she flung poor Jacob into the open window of a running car. The other mother never saw it coming. Poor Jake! He hated cars. He went into that open window and came back out with all claws and a wild look in his eyes. I don’t know how badly the kid in the front seat got scratched, but I’m pretty sure it wasn’t pretty. The lady in the station wagon had no choice but to put it in gear and drive away as Mom stood there with her hands on her hips. Denny chased after Jake to calm him down. I took notes.